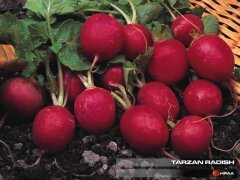 Because radishes are so quick to crop, don't sow all the seeds in one go, but at weekly intervals, for a successional crop through summer. A member of the cruciferous family, which also include Brussels Sprouts, cabbages, and cauliflowers and as such contain sulphurous componds which have been linked to protection from certain types of cancer. Sow March through to September in a well prepared bed of fine tilth. Sowings should be made about 2.5cm (1 inch) apart and 1cm (1/2in) deep to avoid the need to thin out. Should you need to thin seedlings out this should be done as soon as possible. 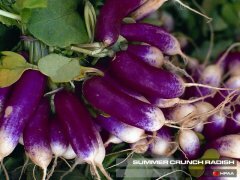 Winter cultivars should be thinned to 15cm (6in) apart. 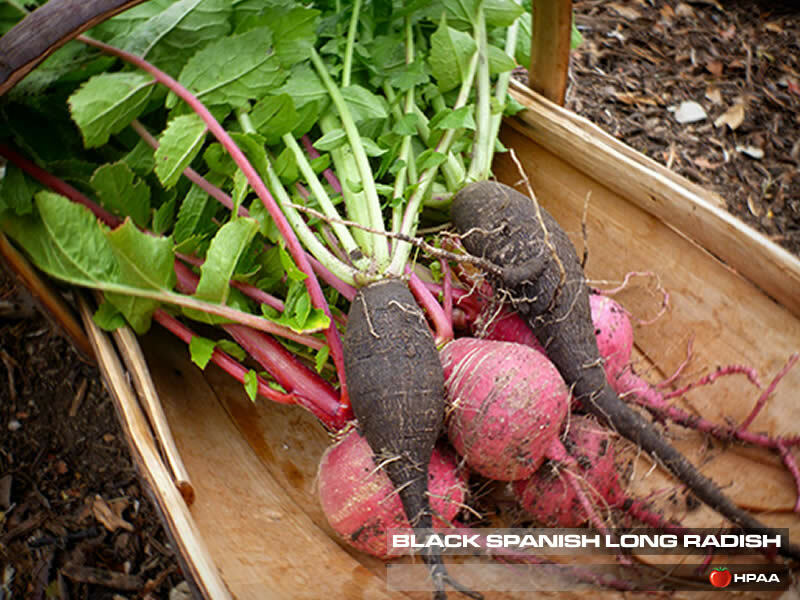 Keep the soil moist to ensure rapid growth, and to keep the roots fleshy and tasty & prevent splitting. 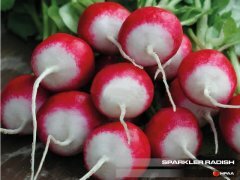 Because radishes are quick to mature they can be used as a 'catch crop' being sown between rows of slower-growing vegetables such as peas and potatoes. 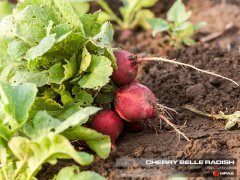 A clever idea is to use the radish as a ediable crop marker for slow-germinating crops, such as parsnips and onion as the radish germinate quickly, marking out the row where other crops have been sown and can be pulled before interence with the main crop. 5. 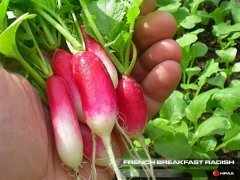 Radishes are best eaten when young - if left in the ground they develop a woody texture and bitter flavour. They're usually ready after four weeks. 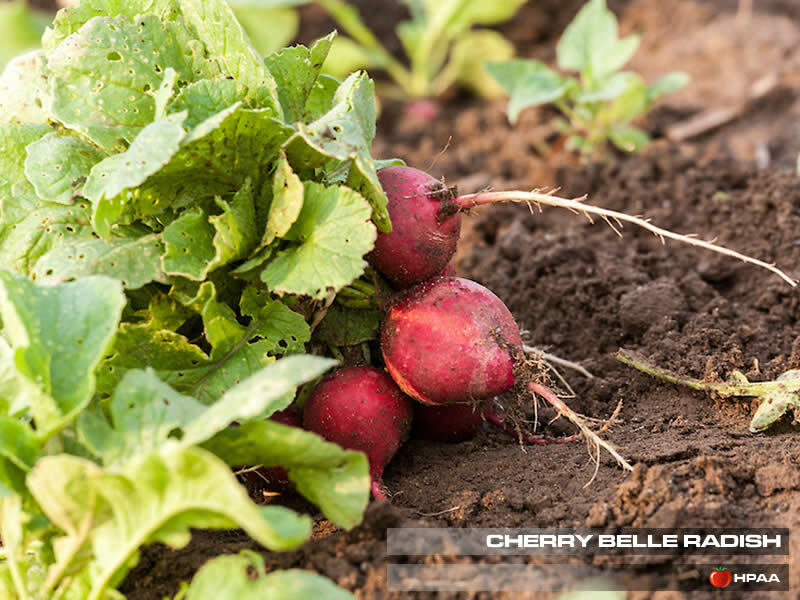 Scrape away the top layer of soil before you harvest. 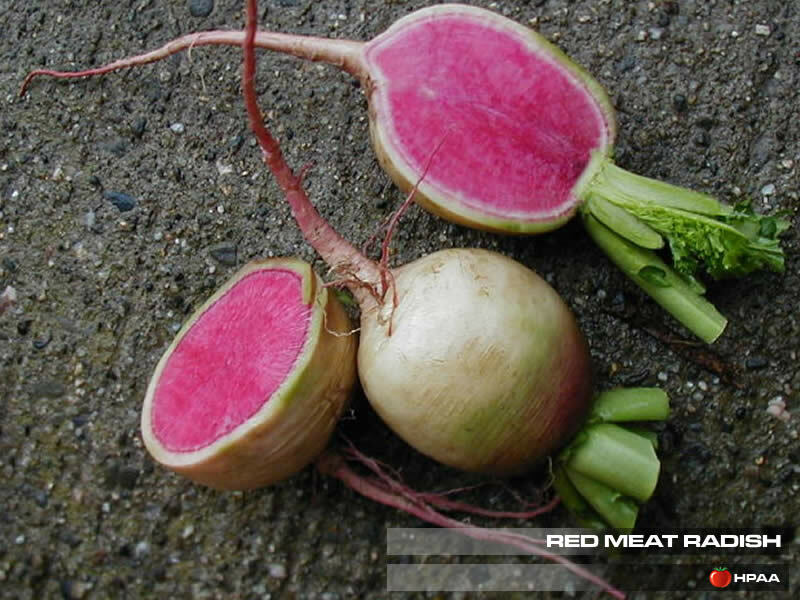 If the radish is roughly 2cm in diameter, gently pull it from the soil. Cherry shaped and cherry coloured. Pure crisp white flesh which is slow to go pithy and woody. Mild flavour. One of the most famous varieties but I have yet to see it eaten first thing in the morning in France. Long roots of red with a white tip. Japanese type giving long white roots with crisp flesh. 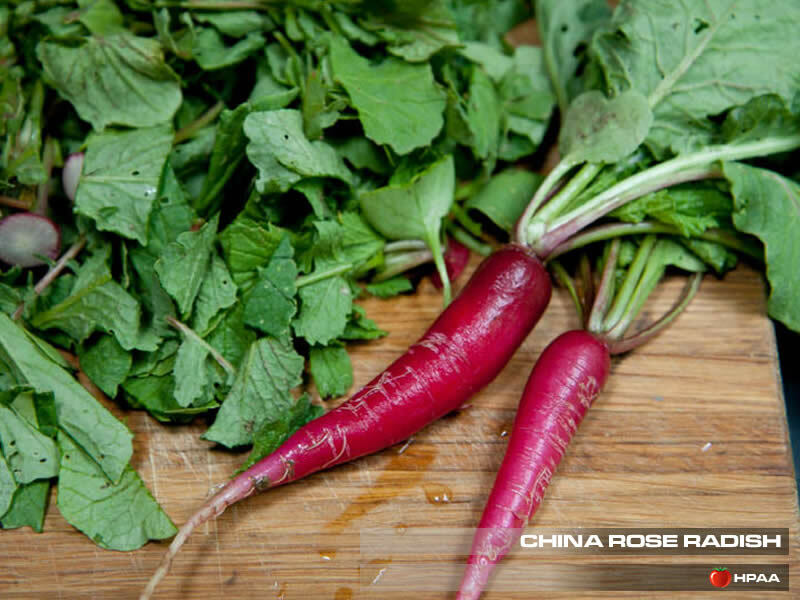 Use peeled and sliced in salads or added to stir-fry cooking. Grown for seed pods. Plants should be about 6-8cm apart. 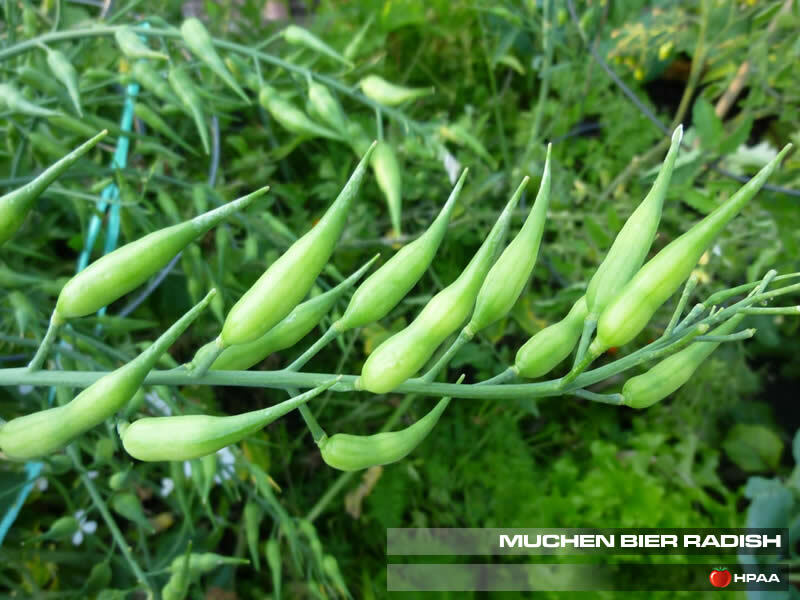 Quickly goes up to flower and produce seed pods which should be used when green and crisp and can be snapped easily. Raw in salads or in a stir-fry. Spicy flavour. 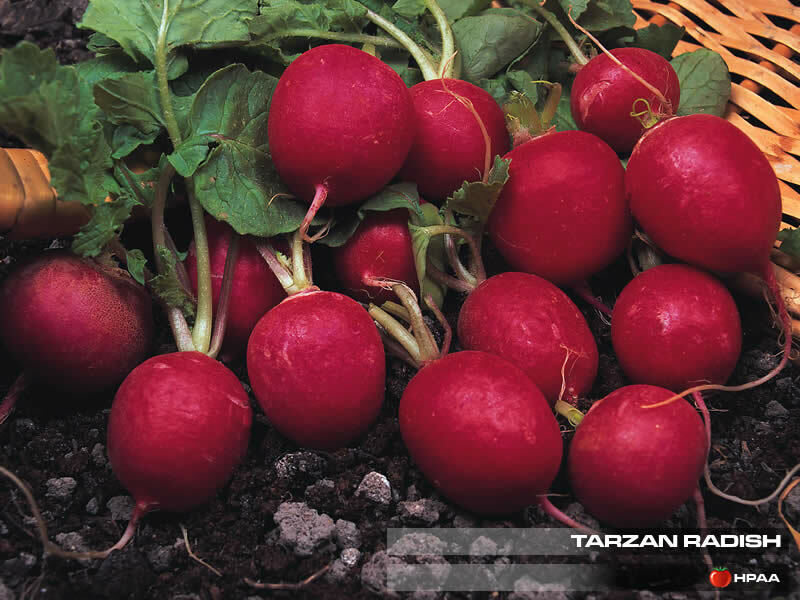 Quite large round roots with red topped white skin and delightful deep rose coloured flesh. Ideal for slicing for both fresh or stir fry use. Good traditional variety giving lovely round roots of bright red. Suitable for early cropping under cloches. Attractive on a salad plate, bright red round roots with a white tip. Mild flavour and crisp flesh. 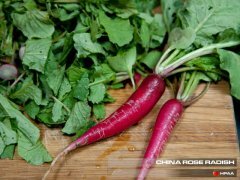 Our own introduction, semi-long stump ended roots with deep pink skin with pure white tip and flesh. Sweet flavour and crisp texture. Excellent variety for autumn or under cover in early spring. it quickly forms roots which are very uniform. 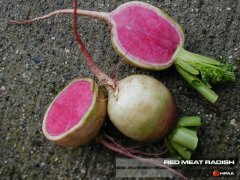 The nice, round radishes are a deep, rich red colour and keep well. Also very high yielding. Sowing December-March or September-October. 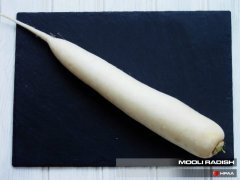 Long tapered roots with dark brown skin and pure white flesh. 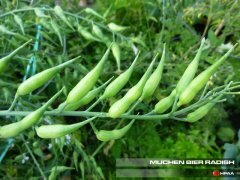 Can be left in the ground and harvested in winter or stored in dry sand in frost free shed. The round counterpart to the above. 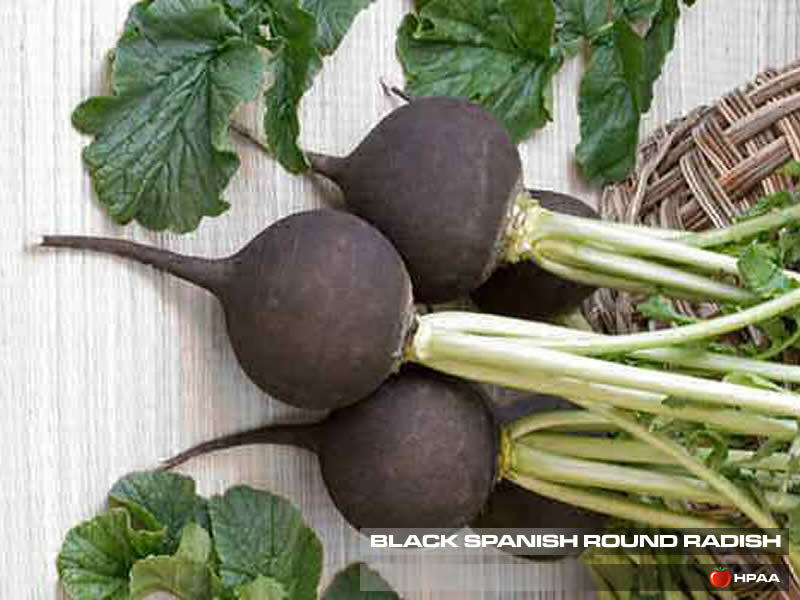 Both have crisp tasty flesh which can be sliced or grated for use in winter salads. Medium large oblong shaped roots with rose pink skin and pure white flesh. 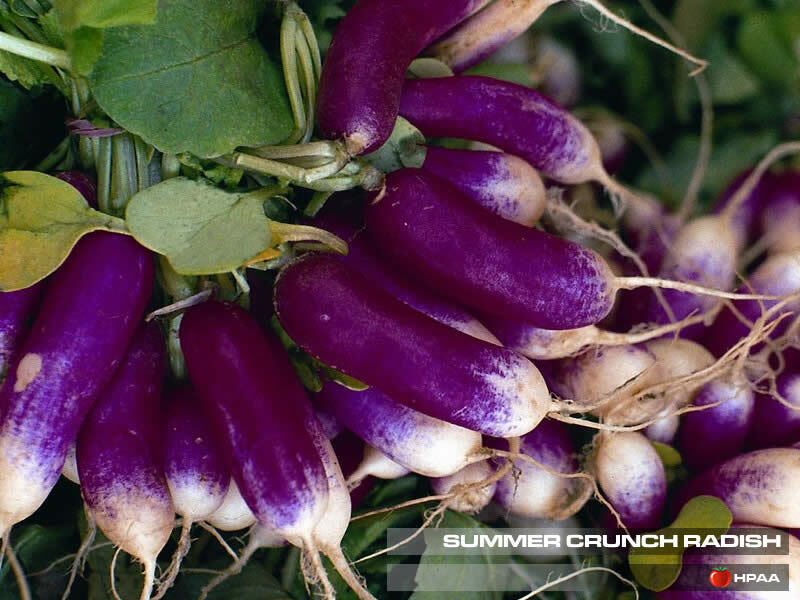 Can be harvested in autumn and stored in dry sand in frost free conditions. Excellent variety for autumn or under cover in early spring. it quickly forms roots which are very uniform. The nice, round radishes are a deep, rich red colour and keep well. Also very high yielding. Attacks by flea beetle cause lots of tiny holes in the leaves. The damage is only superficial, so usually not worth worrying about. If it is a particular problem in your garden you can cover the seedlings with horticultural fleece. Feed on the young seedlings. You’ll see the tell-tale slime trail of slugs and snails on the soil around your crop, as well as on the leaves. There are many ways to control slugs and snails, including beer traps, sawdust or eggshell barriers and copper tape. Slug pellets of powders based on aluminium sulphate or ferric phosphate are less toxic for wildlife. This is a common disease of brassicas, but less so on radishes, as they are not in the ground so long. The leaves will turn yellow, with white, fuzzy patches on the undersides. The radish root may also turn brown. Remove infected plants as soon as you see them. 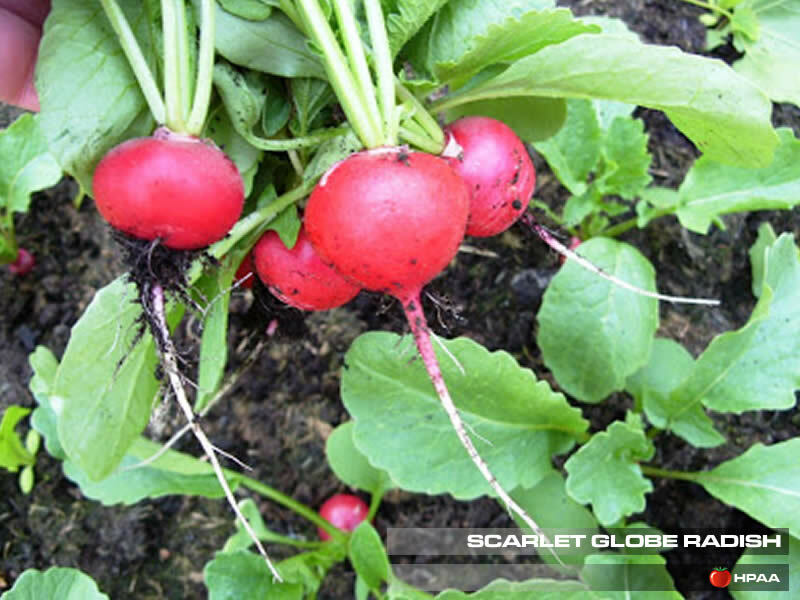 Don’t plant radishes in the same place as previous brassica crops. There is no chemical control.